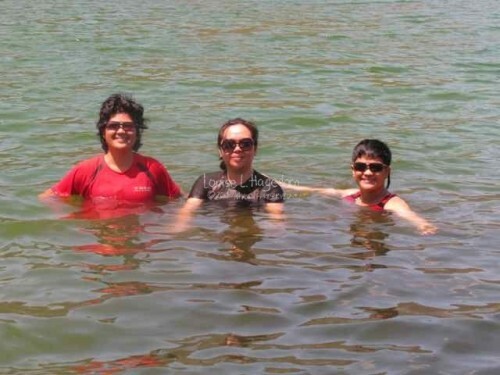 We started our trip to Taal Crater Lake at the Taal Lake Yacht Club (TLYC) in Barrio Sta. Maria, Talisay, Batangas. 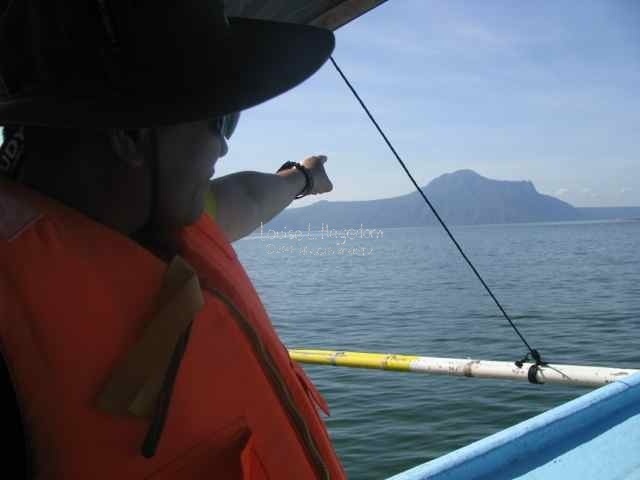 They offer Taal Volcano tours that, at first glance, seem more expensive than your ordinary boat operator. If you’re on a budget, still consider what they offer, because what they offer is value for money. 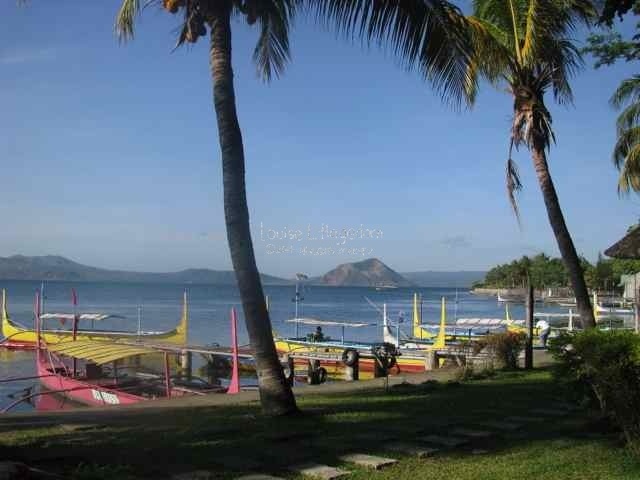 Lake view of the Taal Lake Yacht Club. The TLYC offers boats that are both fast and safe. The limit the number of passengers equal to what is the rated capacity of the boat. No exceptions. Their life jackets have zippers to keep them closed, the sides use a rope system that tightens or loosens it according to your needs, a storm whistle to call for help in case you fall overboard, and sewn reflector tape markings. If you’ve ever had to use a life jacket that is ill-fitting and cuts into your skin, you’ll understand why I appreciate the TLYC’s life jackets. Included in your TLYC package is a guide and a boat operator. The boat operator stays with the boat. The guide goes with you through the trail. Our boat operator was Greg, and Jason was our guide. Prior to leaving TLYC, Jason informed us of the charges we would have to pay for to take the Secret Trail, aka Adventure Trail. We decided that we would take horses, as we are out of shape. 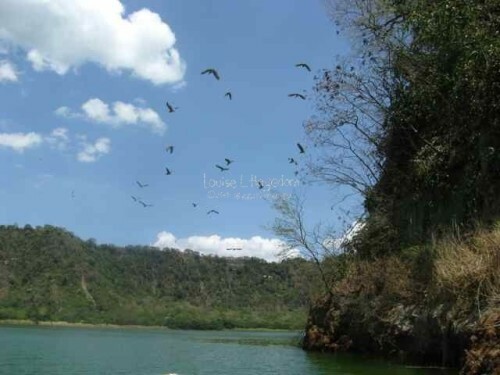 There is a guide fee (PHP350.00, approximately USD 7.00), boat landing fee per boat (PHP50.00, approximately USD1.10), tourism fee per person (PHP50.00, approximately USD1.10), and per horse rental fee (PHP750.00, approximately USD 15.00). Since we were three persons using 1 boat and 3 horses, our total cost for that portion of the trip was PHP2,800 (approximately USD62.00). 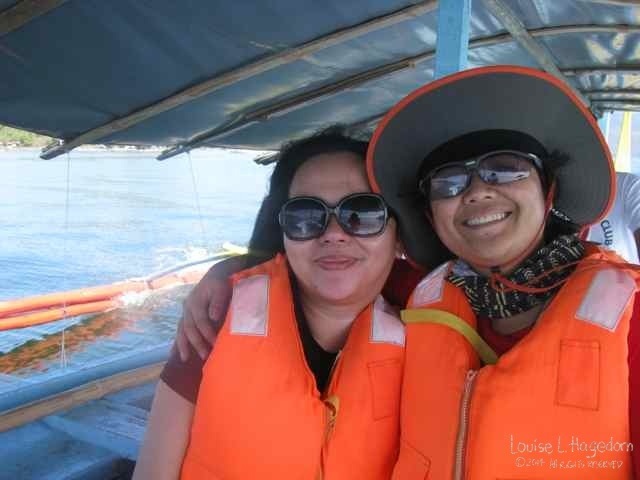 Liza and Mars using the cool life jackets from Taal Lake Yacht Club. The boat seats 5 persons. On the outside, it looks like a standard banca (outrigger boat). The engine is another matter. It is both fast and efficient. There are no fuel fumes, the boat is clean. I was pleasantly surprised not to have my teeth rattle in time to the engine as in many other banca rides across the Philippines. It is still loud, but you can still have a conversation with your seat mate as you speed along. 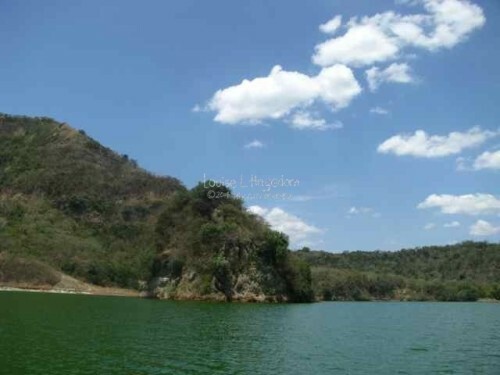 The boat ride takes approximately 40-60 minutes, depending on the lake conditions. Remember what I told you about safety? TLYC boats will not traverse the lake if weather conditions are dangerous. We were fortunate that the conditions were good. Reggie pointing out Mt. Makulot. As you travel the lake, you will see the different fish pens. Some have birds on them. These birds are smart. Instead of wasting energy looking for fish across the water, they rest at the fish pen. If they happen to catch a fish while resting, all the better! 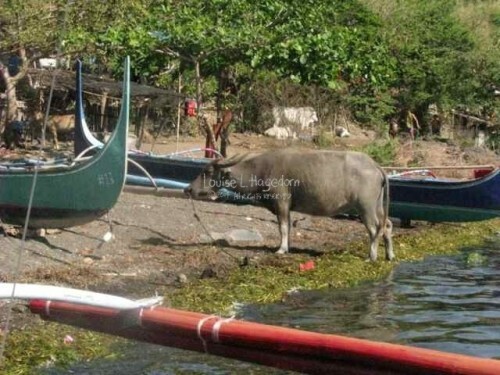 A carabao (Philippine water buffalo) at the lake shoreline. Once we landed at the island, we handed our money to our guide Jason to pay the fees. Getting the horses are entirely up to you. Be aware of your fitness level before deciding you don’t need a horse. Most portions of the climb are very steep, and there are very few areas that are flat. It’s an almost constant ascent or descent for the entire climb. There is a sari-sari store where you can buy some supplies and take a toilet break before going up trail. We bought fresh eggs as we heard that you could boil them in Crater Lake. We decided to take the horses with us, but walked first. 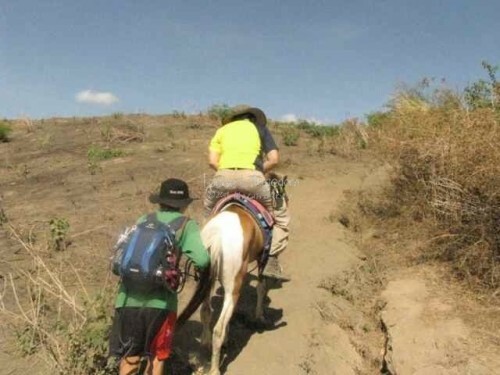 Before leaving, our horse handlers informed us that when the horse is going uphill to lean forwards, and while going downhill, lean back. Reggie made it past the first incline, before riding on the horse. 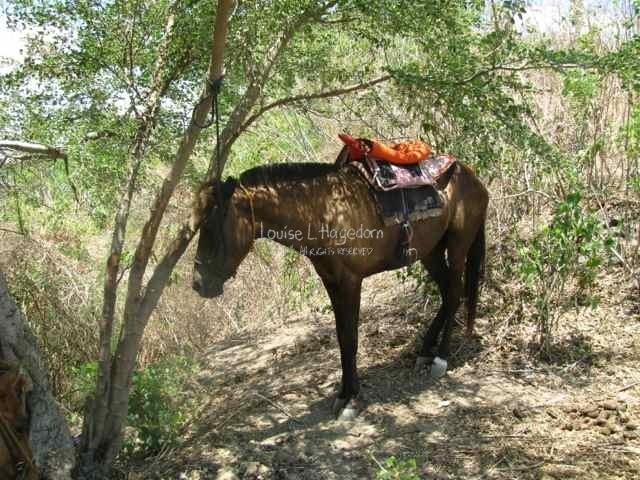 Reggie leaning forward while her horse climbs uphill. We were told that walking up to the summit takes about 40 minutes. This is an arbitrary number entirely dependent on your health and skill level. After about 200 meters, I got on the horse too. After seeing what we had to traverse, it would have taken us at least 80 minutes or more. Liza lasted the longest on foot, and went maybe about 200 meters more before riding her horse. That’s almost a 90° angle. It might not have been like that all the way, but it certainly felt like it. When you reach the summit, the view of the crater lake is completely worth it. View of Crater Lake from the summit viewing deck. There is a small structure at the summit with a drink stand selling water and sodas. Sodas cost PHP50.00 (about USD1.10) each. Since our horse guides didn’t seem to have any water with them, we bought them drinks. While resting at the summit, our TLYC guide Jason shared information about Taal Volcano, and its environs. 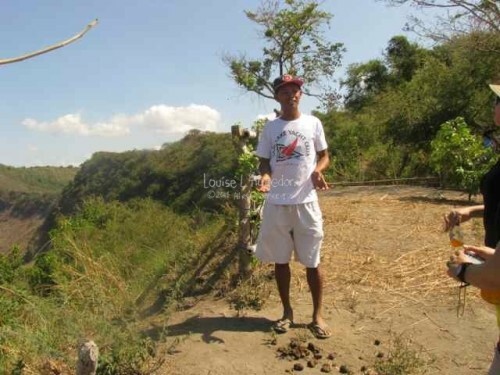 TLYC Guide Jason sharing trivia about Taal Volcano, Taal Lake and its environs. Yes, there is some horse poop on the trail. After resting at the summit, we rode the horses to descend to the Crater Lake. The horses travel about 1 kilometer in 15-20 minutes. Faster if your horse decides it wants to trot down the slope. At the lake side, there is very little shade. There used to be a small hut, but it was destroyed during Typhoon Ondoy. There are plans to build another one. Liza and Reggie with the gadgets to take pictures of Crater Lake. 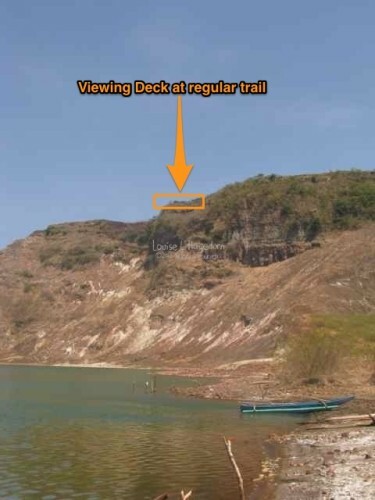 If you look up, you’ll also be able to see the viewing deck accessed from the usual trail to Taal Volcano. 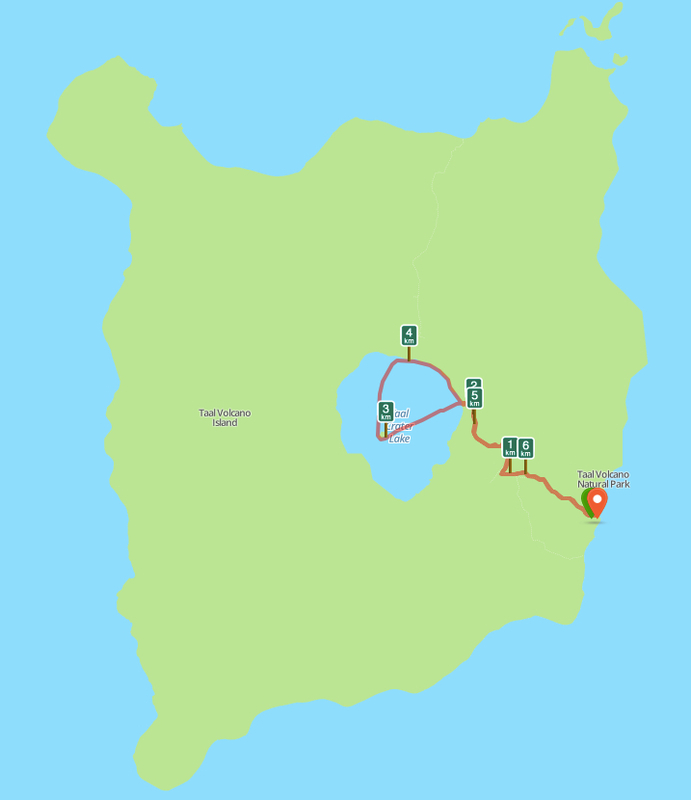 The usual trail taken by tourists doesn’t have any way to access Crater Lake. Since we were at the lake, we decided to go for a dip. We made sure we didn’t have to change by wearing quick dry clothing and bathing suits underneath. Mars, Liza, and Reggie enjoying a dip in Crater Lake. Chatting while relaxing in the water. 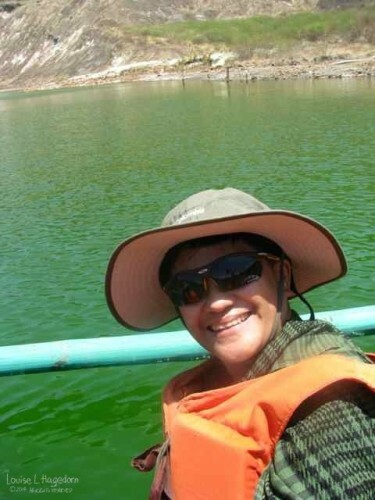 The water was alternately hot and cold due to the fumaroles/solfataras in the area. You right hand feels hot water, while your legs are in cold water. It’s an experiential observation of thermoclines in water. One last picture in the water. There is a boat you can ride in Crater Lake. The asking price is PHP600 (approximately USD14.00) per person. We decided to take it, to get a closer view of the rest of the lake. Reggie on the Crater Lake boat. A closer look at the inner island in Crater Lake. 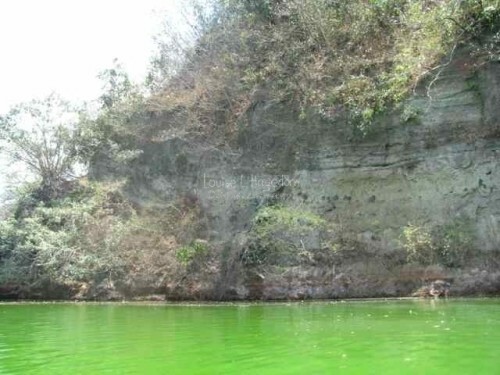 Philippine Institute of Volcanology and Seismology (PHIVOLCS) has a sensors around the island and lake shore to measure seismic activity. The boat’s motor scared the birds staying in the island, causing them to fly away. Crater Lake’s water color is due to the minerals released by the volcano. 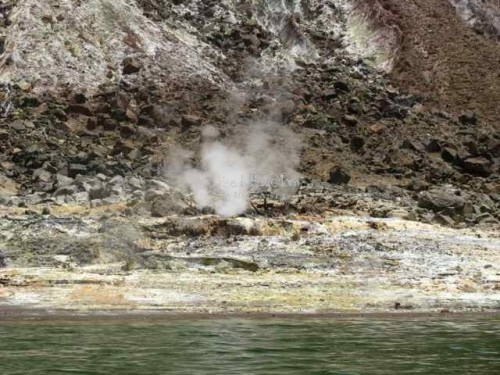 A fumarole/solfatara along the shore. Fumaroles/solfataras forming crevices along the volcano’s interior. 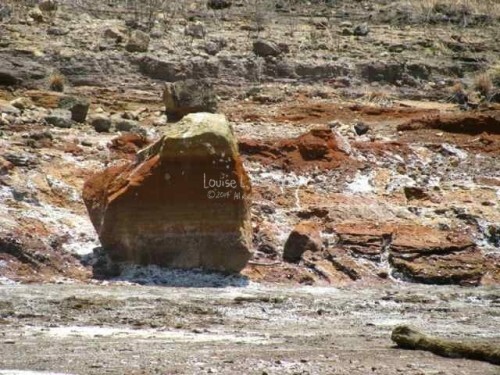 The rocks get marked with water lines. 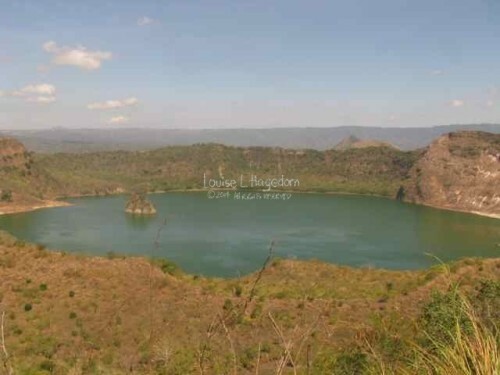 The lake level changes with the accumulation of rainwater and water evaporation. 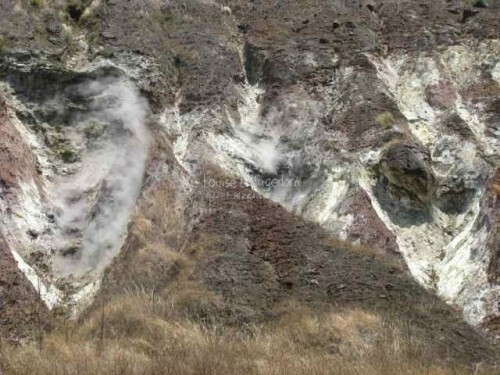 The soil and rocks discolor due to mineral deposits from the volcanic activity. 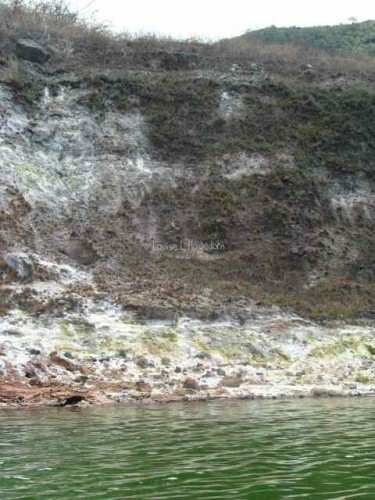 During the boat ride, TLYC Guide Jason boiled fresh eggs we had brought in a nearby fumarole. There is no food you can buy at Crater Lake. We were warned beforehand, and brought a packed lunch. After lunch, we packed up and headed back. We stopped at the summit for a hydration break. The horses moved faster heading back. 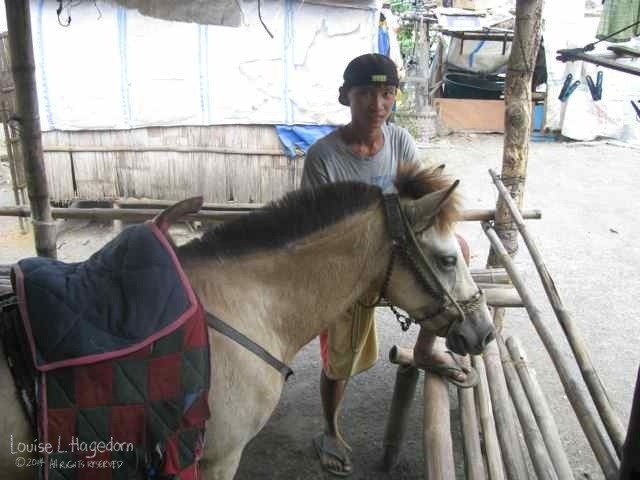 My horse tried to bring me straight to her stable instead of dropping me off at the sari-sari store. People who say taking the horse is not work have not tried to stay on a horse going at a trot or faster up and down an almost 90 degree incline. I worked hard to stay on the horse! My muscles were aching by the time we finished. It’s also a good idea to wear gloves to prevent chafing while holding onto the saddle. The stirrups are made with with available materials, and are not adjustable. The saddle is made of a wooden frame covered with a several rugs. Wearing boots to protect your ankles and calves is strongly recommended. 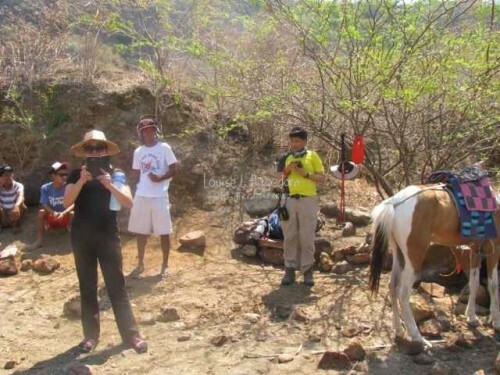 For experienced horse riders, you will need to discuss with the horse guide who will control the horse. There is a lead line, but no reins. The guide holds the lead line and uses it to control the horse supplemented with verbal commands. The verbal commands are not words per se, but defined sounds that can be made when you’re out of breath. The horses are smart, and sure-footed. They know where they’re going, and will be able to get you there safely. Like people, they have their distinctive personalities. Mine was constantly trotting, and wanted to go as fast as she could. Liza’s horse was calm, and easy-going, but was easily distracted, and tended to go off in another direction. Reggie’s horse was slow and sure. The local economy is boosted by tourism. Their main source of livelihood is fishing, supplemented by planting kamote (sweet potato) and kamoteng kahoy (cassava). There is only one school with two teachers that teach Grades 1-6. If the locals want to continue their education, they need to travel to the mainland. This difficulty usually leads them to stop schooling and work to help support the family. The horse guides only get at most 2 bookings a week during the summer. Most of the money they earn goes to the care of the horse. Including rest stops, the trip on the island lasted about 4 hours. The trail we traveled, taken using Runkeeper mobile app. 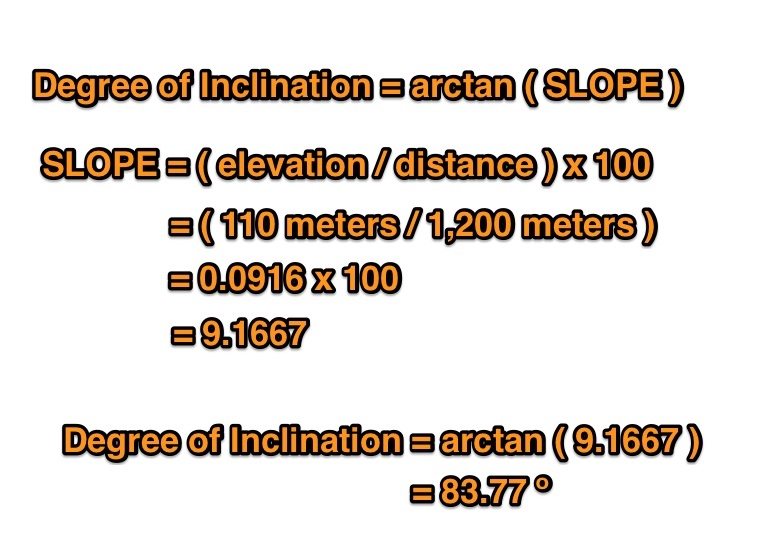 The recorded distance was almost 7 kilometers. The boat ride back took another 40 minutes. From Taal Lake Yacht Club, the trip took about 5 hours and 30 minutes. Your travel time home may vary according to traffic conditions. UPDATE: The original post mislabeled fumaroles/solfataras as geysers. The sentences have been corrected. Thank you to Arlene Tengonciang for the correction! I love learning new terms.